Every dog needs a leash and we've got you covered here! Short, long, nylon, cotton, leather, training, and more. There are also specialty leashes that address needs for easier toileting, competition, or when one leash is needed that combines the freedom of a walking leash with the control of a shorter traffic lead. On Lead leashes have no stitching or rivets as these tend to pop or break long before your lead is worn out. All of the products are individually crafted with simple hand tools, with no mass production or machinery. We love the bull-hides as they are more stretchy and springy than the latigos. They are also wonderfully soft and supple right from the beginning. That means there is no working in of the leather, that can takes years of use. It is just immediately luxurious in your hands. Made by hand in New Mexico, your dog's name is embroidered on an array of wonderful patterned or Swiss velvet collars. You can even pick out an extra little decoration to make the collar all the more special, such as a flower (as shown), star, or heart. You’re not just getting a dog collar or leash. Instead, think of it as purchasing a little piece of art that reflects your dog’s individuality. A Tail We Could Wag features both traditional side release buckle collars as well as the Martingale type (shown here). Using hand-woven material made in Guatemala and then hand-sewn/finished in the U.S., each colorful collar and lead is 100% colorfast making them machine washable. Combined with premium nylon webbing and solid brass hardware that won't ever rust or chip, these collars and leads stand up to an ocean of wear. Sizes range from X-Small to X-Large, with matching 4 and 6-foot leads. WE LOVE THIS FASHION DOG HARNESS. It is amazingly made and designed for ease of use. It is a breeze to slip on over your dog's head and has only one adjustment and buckle to attach at your dog's side. 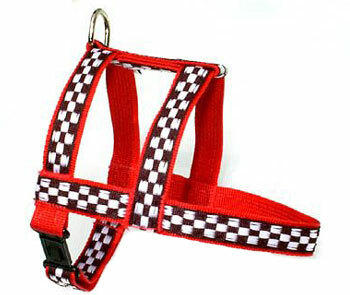 It's the fastest dog harness to put on and take off and the easiest to fasten. Designed for comfort and style, they are constructed from the finest materials and with care and all the experience gained from Sylvan's over 20 years of making pet products. They offer the best pricing in the industry because you're buying direct from the manufacturer when you order any of their line.